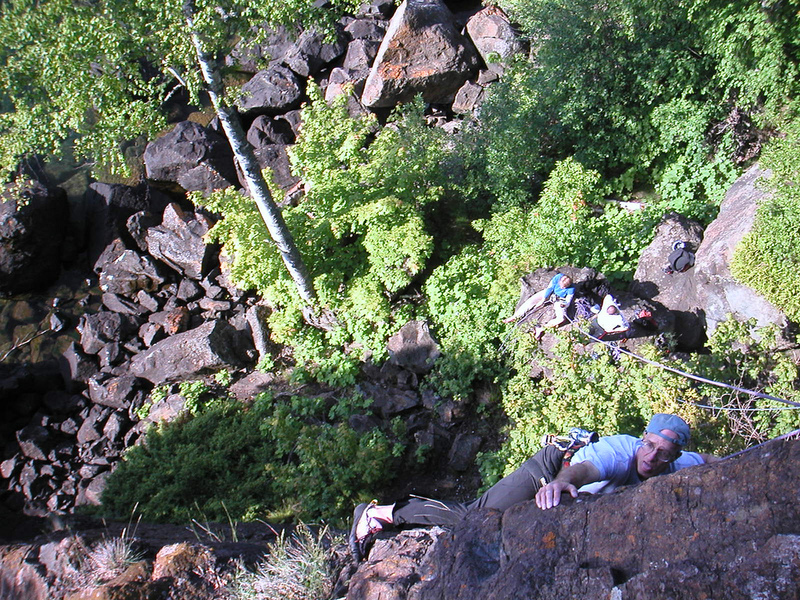 The best part about the climbing in the Upper Peninsula are the crowds… or the lack of them! It is not uncommon to find yourself at one of the best crags in the state on a sunny Saturday afternoon and be the only one there! Many of our climbing areas are hidden back in the woods and offering a peaceful wilderness setting, and the fact that many of these places sit on the edge of the largest freshwater lake in the world doesn’t hurt either! 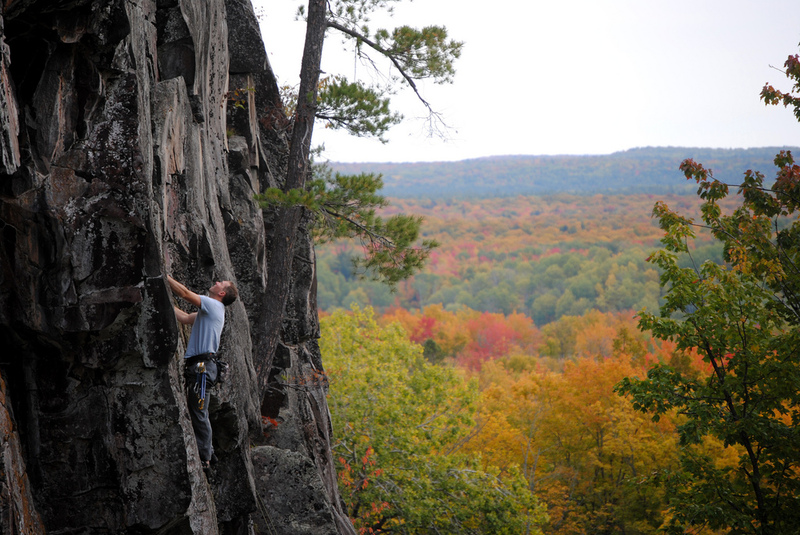 Most of the rock climbing in the Upper Peninsula is found in the areas around Marquette and the Keweenaw Peninsula. There is a variety of climbing available from excellent beginner crags, to sport and trad routes up to 5.12.
seasoned climbers on staff to assist you in planning out your adventure. A just published guidebook: Marquette County Rock Climbing by Jason Schneider is also available, and there is an unofficial climbing guide for the Keweenaw that can be picked up at our Houghton store. These are the classic climbs and you won’t want to cut your roadtrip short without baggin’ these. The Traverse is the local bouldering test piece located at a Marquette city park, Presque Isle. The setting for the problem might make it a classic in itself – situated directly above the crashing waves of Lake Superior – but it is the lower traverse rating at a stout V6 that really makes it the hardman route of the area. Both the Upper and Lower Traverse start from right to left with the Upper Traverse being the easier of the two. This is one of the classic sport climbs in the area. The routes only 35 feet and 4 bolts, but the crux is right off the ground and the rest of the route keeps you on your toes. The climb starts off with a slightly overhung sloper on the right and moves to a small in-cut edge on your left. Once you gain the arete you’re past the crux, but now have some very thin moves up to another overhang. Once to the overhang the holds become more positive. This is probably our favorite climb in the area. It starts out on an easy slab and then moves into the crux at the slight overhang. The sequence can be a little tricky and can feel much harder than the rating. After the crux, finish on small face moves at the pine tree that hangs out over the route. Again, this route is great on lead, but can easily be top roped. This route finishes just below the start to Rated PG and makes for a super fun pseudo 2 pitch sequence. This route is ~70 feet. This is one of the classic routes in the area and is a lot of fun for everyone. This route starts right at the base of the Obsession buttress and climbs up and through the small v-notch in the overhang. The route is great for the beginning leader and can easily be top-roped. This route is ~95 feet.